Right now it’s the mid-afternoon lull, the time when any decent photographer is bone tired, having arisen before dawn to snag those incredible sunrise images. I’m onboard the Northern Expedition, a British Columbia ferry traveling between Prince Rupert and Port Hardy, a 15-hour journey through the spectacular Queen Charlotte Islands of the Canadian Pacific coast. God, they’re beautiful! Dense evergreen forest covers the mountains from summit to sea as we weave through narrow channels along our 500km route. Ferries are noisy ships, since they depend on significant horsepower to power hundreds of cars, passengers, crew and supplies. You can feel the vibration of the engines clear into your bones no matter where on deck you stand. But, the human body is an amazing organism and our very bulk and loose connections between bones absorb some of that vibration. And so my first lesson, if you will. Don’t lean against a wall or, worse yet, put your elbows on the railings to stabilize your shots. You’ll simply serve as a vibration transmission machine (VTM, in scientific parlance) and wonder why your shots are fuzzy or blurry. That very naturally leads to the second lesson, which is that a tripod is less than totally useless on a ferry (or most other boats). I watched a young man mount a video camera atop a rather flimsy tripod. Even at a distance I could see the danged thing vibrating. The tripod, being a fairly rigid piece of metal, a very useful characteristic on solid land, is simply a VTM on steroids. And with no muscle, fat, tendons or ligaments, it transmits VTM faster than a sick kid does his cold virus to his daycare buddies. The solution? Hand-hold your camera, elbows at sides. Shoot at 1⁄250 or faster. Open the aperture to f8 or wider (f5.6, 4, 3.5, 2.8), which usually is not a problem since most water landscapes are at a distance and depth of field may not matter quite so much. If that doesn’t help, dig deep into your camera menus and raise your ISO (assuming your point-and-shoot allows that). If you have a simpler point-and-shoot that doesn’t allow ISO adjustment, and it has a sports mode, try it. Sports mode is designed to allow you to shoot at a faster shutter speed to capture action. One final observation. Straps. Use them wisely. Here’s what I mean. Probably 95% of the people I saw using their cameras, DSLRs as well as point-and-shoots, didn’t have the strap around their hand or neck. Come on folks! 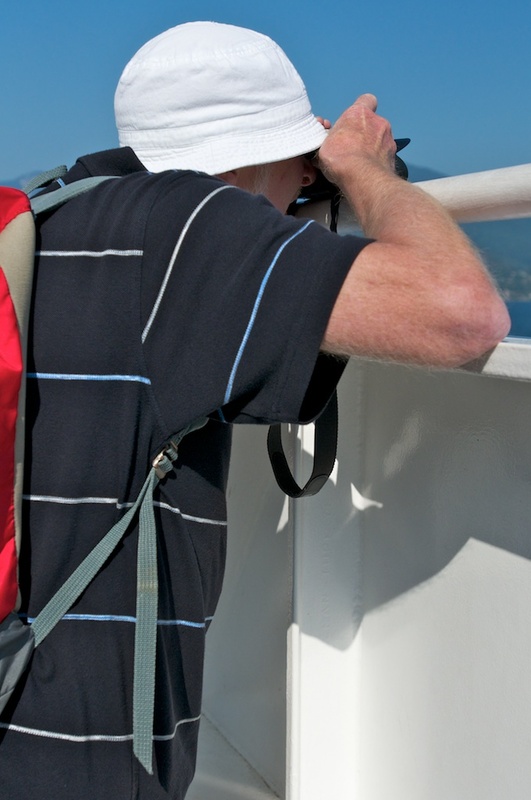 A strap is the cheapest form of camera insurance you’ll ever have! On the other hand, a strap can be a major liability. Here’s how. 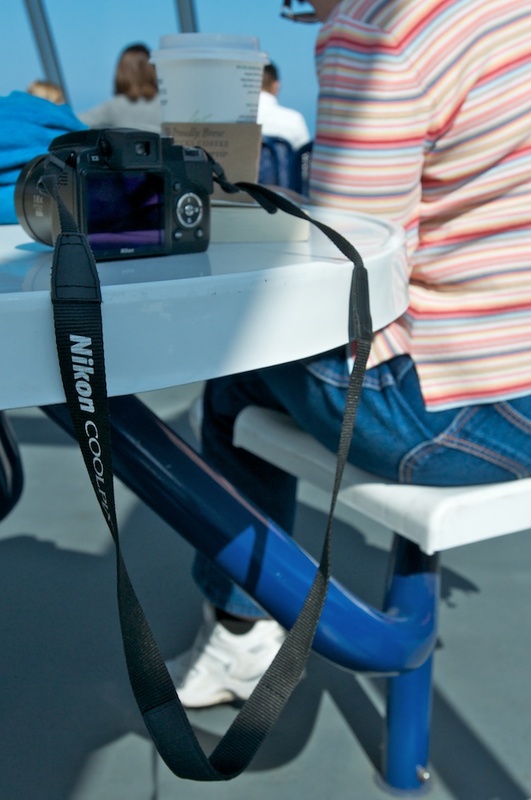 I walked through the ferry’s cafeteria and saw half-a-dozen folks put their cameras on the table, the strap dangling down. It seems to me that’s inviting disaster. I was once on the Big Island of Hawaii and saw a man place his high-end Cannon DSLR with a 500mm lens on the tailgate of his SUV. That, by the way, represented a $15,000 investment, minimum. The strap was hanging down. He reached into the SUV to retrieve his camera bag and as he pulled away, the bag caught his camera strap and pulled the entire rig to the ground. To this day I can’t understand why that guy didn’t get down on his knees, crying, his arms outstretched to the lens, which was scattered into at least 350 pieces on the gravel. But it etched into my mind what my father thankfully drummed into my head when he gave me my first camera. NEVER let your camera strap hang carelessly, even for a second.